Resting peacefully in the heart of Hocking Hills in Ohio, Glenlaurel Inn is a luxurious Scottish-style country inn that captures the beauty of the surrounding area. Combining old world elegance, romance and modern day charm, the Inn is located just an hour away from Columbus and boasts award-winning accommodations, gourmet cuisine, deluxe amenities, and exceptional service. The inn features a traditional Scottish pub that serves a variety of local and craft beers, fine wines and Scottish malt whiskeys, an exclusive spa offers an array of massages and treatments, and a gourmet restaurant serves breakfast and multi-course dinners. The peaceful sanctuary is surrounded by 140-acres of natural scenic beauty crisscrossed with excellent hiking trails, cascadingwaterfalls and deep, mystical gorges, and a championship Scottish Links golf course with original hickory shaft clubs, sand tees, and sand greens. Hocking County is an area of outstanding beauty with lush woodlands, deep rocky gorges, cascading waterfalls and incredible rock formations. Formed over 5,000 years ago as an eroding weave of sandstone gorges, the rock and ridge canyons of the Hocking Hills are a geological anomaly and home to a diverse range of microclimates from verdant forests to fern-filled wetlands. There are six state parks within close proximity of Glenlaurel Inn that offer an array of recreational activities from year-round hiking, biking, zip lining, horseback riding, boating, and canoeing. 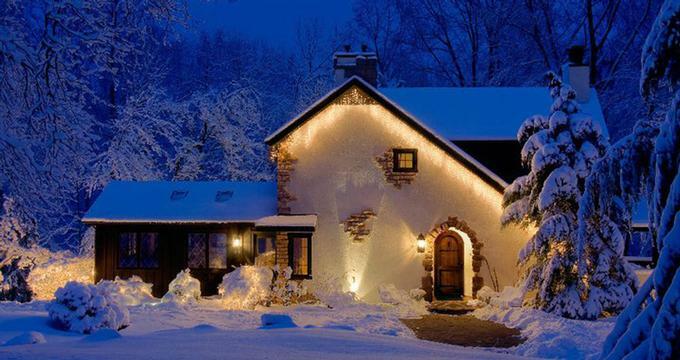 Glenlaurel Inn provides a range of elegant accommodations in the form of beautifully appointed guest rooms, luxurious suites, private crofts and cozy cottages with modern amenities and lovely views. All accommodationsaredecorated in splendid country-style décor and feature standard facilities and amenities, such as private en-suite bathrooms with showers and bathtubs, luxury bathrobes and deluxe bath products, gas fireplaces, and beverage centers withshortbread cookies and drinks. Standard amenities that can be found in every room include flat screen televisions with DVD players, CD player with CDs, coffee makers with complimentary teas and coffee, telephones, irons and ironing boards, hairdryers and central climate control. A complimentary full gourmet breakfast is served every morning. The Carriage House has two well-appointed guest rooms and one luxurious suite, namely the Robertson Garrett and Mar Rooms and the Douglas Highlander Suite. Located on the top floor of the Carriage House, the Robertson Garrett and Mar Rooms feature queen-size beds, private en-suite bathrooms with bathtubs, showers, luxury bathrobes and deluxe bath products, a fully equipped shared kitchenette and a comfortable sitting area. Additional amenities include flat screen televisions with DVD players, CD players with CDs, coffee makers with complimentary tea and coffee, telephones, iron and ironing boards, hairdryers and central climate control. 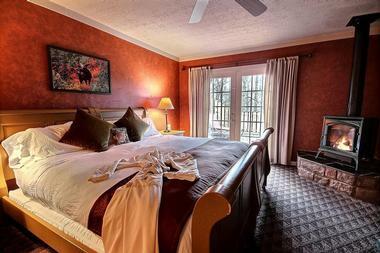 The Douglas Highlander Suite is situated on the first floor of the Carriage House and features a queen-size bed, a private en-suite bathroom with a shower, a deluxe two-person whirlpool tub, luxury bathrobes and luxurious bath products. A small, fully equipped kitchenette has a table and chairs for leisurely breakfasts, a cozy living area withtwo ottoman seats and a loveseat based near a Franklin stove, and large windows embrace beautiful views of the surrounding woodlands. 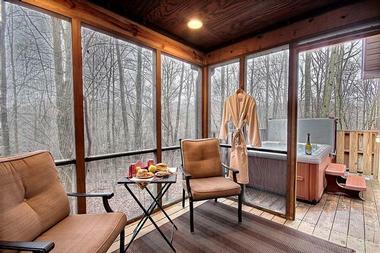 An extensive sheltered deck juts out into the treetops. Additional amenities include a flat screen television with DVD player, CD player with CDs, coffee maker with complimentary tea and coffee, telephone, iron and ironing board, hair dryer and central climate control. The original home of the Laird and the crown jewel of Glenlaurel, the Manor House boasts a magnificent stone and stucco façade, three elegant dining rooms, the Waif's Haven Kitchen, the Loch Ness Pub, two stylish guest rooms and two luxurious guest suites. Situated on the first floor of the Manor House, the Campbell Room is delightful with its queen-size bed, private en-suite bathroom with a shower, two-person whirlpool bathtub, luxury bathrobes and deluxe bath products. A bright and airy sitting room has a cozy gas-log fireplace in the bedroom and comfortable sofas and a magnificent three-part stained glass window honoring the wildflowers that once grew prolifically on the site of the Manor House. A lovely south-facing deck offers gorgeous views of the wedding garden. Additional amenities include a flat screen television with DVD player, CD player with CDs, coffee maker with complimentary teas and coffee, telephone, iron and ironing board, hair dryer and central climate control. Nearest to the kitchen and first in line for the mouthwatering aromas that drift from it, the MacGregor Room has a queen-size bed facing an ornate mantelpiece with hand-carved elves and a cozy gas log fireplace. A private en-suite bathroom has a two-person whirlpool bathtub, separate shower, and lovely large east-facing windows that flood the room with natural light. Additional amenities include a beverage center with homemade cookies and drinks, flat screen television with DVD player, CD player with CDs, coffee maker with complimentary teas and coffee, telephone, iron and ironing board, hair dryer and central climate control. Named after Isabella of Mar, who married Robert the Bruce in 1295, the Mar Roomis located on the second floor of the Carriage House and offers a calming, romantic haven for two. The suite features a deluxe queen-sized bed, private en-suite bathroom with a bath/shower combination, luxury bathrobes, and luxurious bath products, and a glorious skylight that floods the room with natural light. A charming sitting room has a comfortable chair for reading, and a small kitchenette offers all the necessary appliances for comfortablevacationliving. Additional amenities include a beverage center with homemade cookies and drinks, flat screen television with DVD player, CD player with CDs, coffee maker with complimentary teas and coffee, telephone, iron and ironing board, hair dryer and central climate control. The Robertson Garrett Room is situated on the second floor of the Carriage House and boasts breathtaking views ofthe valley. A romantic electric fireplace and a comfortable chair in the spacious sitting room offers a cozy place to relax while a kitchenette is ideal for self-catering. The sleeping area features a queen-size bed and a private en-suite bathroom with a bath/shower combination, luxury bathrobes, and deluxe bath products. Additional amenities include a beverage center with homemade cookies and drinks, flat screen television with DVD player, CD player with CDs, coffee maker with complimentary teas and coffee, telephone, iron and ironing board, hair dryer and central climate control. 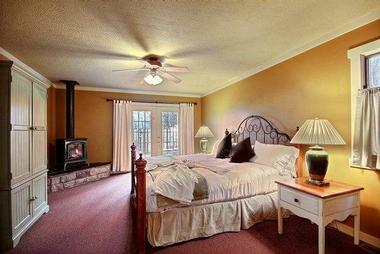 Inspired by the owner's quarters at the original MacTavish Inn, the MacDonald Suite is the master suite at Glenlaurel. Located on the second floor of the Manor House, the suite features two rooms, each of which offers sweeping southerly views of the wedding garden and grand deck. The master bedroom features a romantic four poster canopied bed, a walk-in closet, an en-suite oak-floored bathroom with shower and two-person whirlpool tub, luxury bathrobes and deluxe bath products. A combination living and dining room offers floor-to-ceiling windows that flood the room with natural light, two plush lounge chairs, a cozy gas log fireplace, and a small balcony with lovely views. Additional amenities include a beverage center with homemade cookies and drinks, flat screen television with DVD player, CD player with CDs, coffee maker with complimentary teas and coffee, telephone, iron and ironing board, hair dryer and central climate control. Taking luxury to new heights, the MacKenzie Royal Suite boasts rooms that exude a royal charm. Located on the second floor of the Manor House, the luxurious MacKenzie Royal Suite is decorated in dark oak and rich fabrics and features a comfortable sitting area with a cozy corner nook with an armchair for reading, a quaint writing desk and large windows with beautiful views. The suite has a canopied queen-size bed in plush linens and en-suite bathroom with a two-person whirlpool tub, shower, and bidet. Bespoke bathrobes and deluxe bath products add a special touch. Additional amenities in the MacKenzie Royal Suite include a beverage center with homemade cookies and drinks, flat screen television with DVD player, CD player with CDs, coffee maker with complimentary teas and coffee, telephone, iron and ironing board, hair dryer and central climate control. For added levels of exclusivity and privacy, Glenlaurel offers charming chalets, cottages, and crofts, which are smaller versions of a cottage. Glenlaurel offers guests a choice of three West Crofts overlooking Bannock Burn Ravine, and four East Crofts looking down on the Camusfearna Gorge. Both the East and West Crofts are a short walk from the Manor House and feature spacious bedrooms with queen or king-sized sleigh beds, private en-suite bathrooms with double showers, soaking bathtubs, luxury bathrobes, and deluxe bath products. Handsome living rooms offer cozy stone fireplaces, comfortable sofas, and state-of-the-art entertainment centers with flat screen televisions, Blu-Ray players, and CD players. Small kitchenettes have all the appliances and utensils needed for comfortable vacation living, including a microwave, fridge, toaster and coffee maker and a beverage center which is stocked with homemade cookies and drinks. 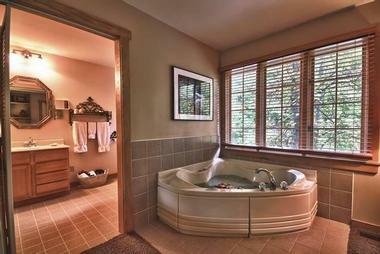 Large sliding doors open onto peaceful screened porches and private decks with romantic hot tubs. The MacIntosh Cottage is named after world-renowned Glasgow-born architect and designer, Charles Rennie MacIntosh and is decorated in rich, dark timber with two gas log fireplaces while the MacKay Cottage is named for the MacKay clan, famed for introducing golf to Scotland. The MacLeod Cottage is named after and honors the MacLeod clan, which is best known for promoting bagpipe music in Scotland, and the MacTavish Cottage embodies the enchanted legend that Ceymus MacTavish was the Laird of the original Glenlaurel estate some 300 years ago. The Muir Cottage is named after pre-eminent naturalist John Muir while the Wallace Cottage takes the name of the famous HighlanderWilliam Wallace of Braveheart and represents the extreme warriorhood that is the center of Scottish history. Boasting legendary cuisine, first-class service, charming Scottish flair, and an elegant ambiance, dining at Glenlaurel promises to be an unforgettable experience. Hearty three-course breakfasts are served every morning in the beautifully appointed dining room, and evenings are taken up with three and six-course prix fixe menus served Sunday through Friday and award-winning seven-course culinary journeys on Saturdays. Candlelight dinners are accompanied by an extensive wine list featuring wines from around the world, poetry, bagpipe music, and a special visit from the Chef. 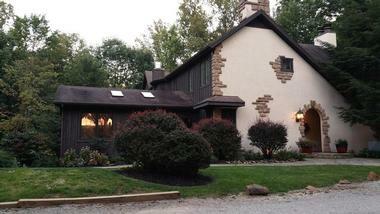 Glenlaurel Inn features a range of facilities, amenities, and recreational activities for guests to enjoy. Leisure activities in the area include year-round hiking, mountain biking, horseback riding, zip lining, canoeing, scenic air tours and world-class golf. Glenlaurel offers an exclusive range of in-room spa services and treatments that promise to relax, rejuvenate and re-energize, as well as private Yoga sessions. Signature massages include Aromatherapy Massages, Bliss Massages, Deep Tissue Massages and Four-Handed Massages’ while body and skin treatments range from Asian Foot Reflexology to Cranio-Sacral Therapy. Other services include personal yoga, reiki sessions, and facials. Glenlaurel Inn offers excellent facilities for a variety of events or functions, including small business meetings, corporate retreats, and social events. The inn has more than 7,000 square feet of space for a range of small corporate functions and events and provides events services including elegant venues, ranging from dining rooms, meeting spaces, and common rooms, catering services, audiovisual equipment and personalized service.